Beer Nerd Details: 9.6% ABV bottled (750 ml caged and corked). Drank out of a goblet on 12/31/12. Ommegang has recently gained some notoriety for partnering with HBO to create a series of Game of Thrones beers. The first beer looks to be a relatively ho-hum affair, a 6.5% blonde ale. Certainly will be approachable for the non-beer-nerd fans of the series, but I'd be more excited if they did something really wacky. I can't say as though I'm excited by this. I like Game of Thrones fine, and Ommegang was the brewery that got me into beer, but somehow this combination isn't doing it for me. I suppose it will prove beneficial to both companies though, and as corporate tie-ins go, this is much better than most. I do wish success on Ommegang though - maybe if they can make enough money, they'll start an actual sour program or something (they've made overtures in that direction in the past, but nothing regular). Tired Hands held a bottle release today, which, as far as I know, is their first official such event (I've heard tell of mythic one-off bottles, and even seen a few empties floating around as decorations, but I'm pretty sure this is the first real release). Approximately 500 bottles of wine barrel aged FarmHands (a saison, one of their two mainstay house beers) was available, and it sold out in less than an hour. Here at Kaedrin, we're big fans of Tired Hands, so we made sure we were there. Not a particularly nice day to wait in line outside, but I'd guesstimate that around a hundred folks were in line ahead of me, and it looked like the supply was dwindling mightily by the time I got my share. As per usual, all the beer dorks on line were amiable folk, so it was a good enough time, and I'm glad that I didn't arrive too late to get my greedy paws on some of this stuff. Beer Nerd Details: 5.2% ABV bottled (500 ml wax dipped). Drank out of a tulip glass on 1/13/12. 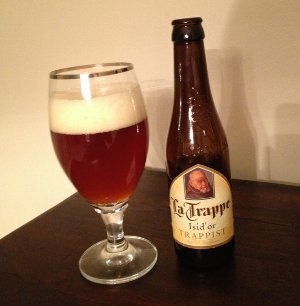 La Trappe always seems like a lesser Trappist due to the fact that they're the only one not located in Belgium. On the other hand, they seem to be the only Trappist that does much in the way of creative new beers. Not that there's anything wrong with that. Breweries like Chimay and Westmalle trace their recipes back to the 19th and early 20th century, originating and codifying some of the styles we know and love today, like dubbels and tripels. 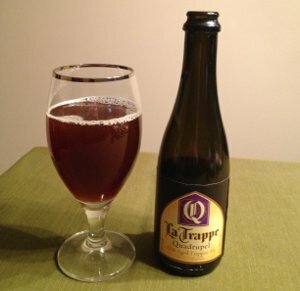 La Trappe, on the other hand, coined the nebulous style Quadrupel way back... in the 1990s. And they're still going. Both of today's beers were first released within the past couple years (though one is simply an old beer that was barrel aged). 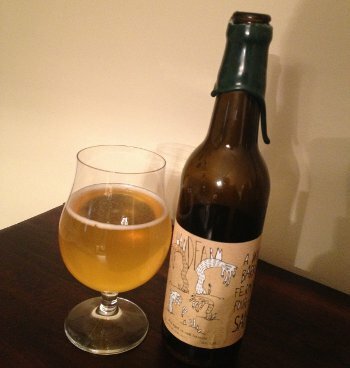 Beer Nerd Details: 7.5% ABV bottled (11.2 oz) Drank out of a goblet on 12/30/12. Koningshoeven La Trappe Quadrupel Barrique (Oak Aged) - Batch #7 - I previously had batch #3 of the oak aged Quadrupel and really enjoyed it. That one was aged in a mixture of new oak, old Port wine barrels, and previously used quadrupel barrels, and it was all a pretty great match with the beer style. This time around, we've got a batch that was aged in old Scotch barrels. The distilleries in question (Bowmore, Tamdhu, Strathspey and Laphroaig) seem to be a mix of Speyside and Islay, which can be troubling. In particular, I've found that beers aged in old Islay Scotch barrels are a bit challenging in that the peaty, smoky flavors really tend to overpower the beer. Now don't get me wrong, I love me some Islay Scotch (Ardbeg 10 is a standard at my house, and their Uigeadail is a recent acquisition that I'm sure will find a place in the rotation), but mixing those strong flavors with a beer that is as highly attenuated as this seems to be a lot trickier than, say, mixing stouts with bourbon. I thought perhaps the Speysides would calm things down a bit, and indeed, this isn't the worst attempt at an Islay barrel aged beer, but it's not particularly special either. Beer Nerd Details: 10% ABV bottled (375 ml caged and corked). Drank out of a goblet on 12/30/12. It looks like Batch #7 is the odd man out, a misfire in a series of otherwise pretty well received oak aged beers. Batch #8 is supposed to also use Scotch barrels, but they blended that with new oak, which I think could really help tone down some of that peaty, smokey flavor (the reviews on RateBeer and Beer Advocate seem to bear that out). Batches 9 through 11 were aged in old Malbec barrels, and batch 12 used old Bourbon and Cognac barrels. So yeah, pretty much every batch of this sounds great, but avoid #7. 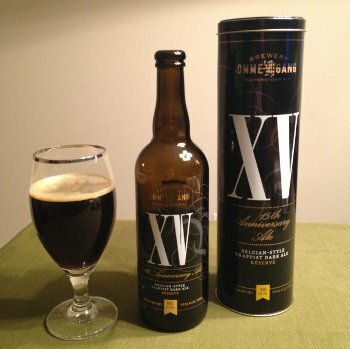 Beer Nerd Details: 9.5% ABV bottled (22 oz. bomber). Drank out of a tulip glass on 12/29/12. I would put this about on par with Double Jack and Gemeni. It's maybe slightly beefier in terms of malts than Double Jack, but perhaps not quite as much as Gemeni. I don't know the hop schedule of this one, but I suspect there's some of that cascade/simcoe and centennial going on, wither perhaps a few others, which I believe puts it right in the same playing field. 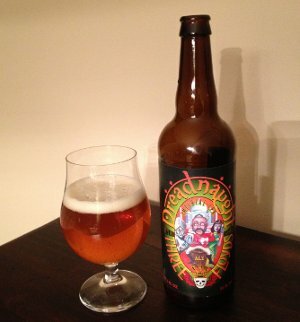 But I'll tell you one thing, Dreadnaught tastes a whole lot harder to get than those two. That being said, I may need to start trading with more Midwesterners, just to keep up a supply of Three Floyds stuff, which has been uniformly impressive. Beer Nerd Details: 7% ABV bottled (750 ml caged and corked). Drank out of a tulip glass on 12/28/12. 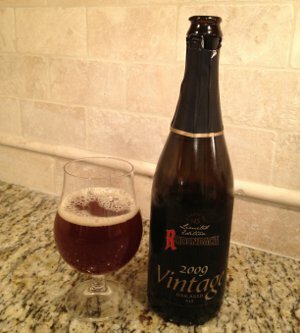 Rodenbach Grand Cru is one of those beers that turned me into a lover of sour beer, so perhaps it's hard for these other vintages to stack up. They clearly share a similar character, and I'll probably continue to seek out any of Rodenbach's specialty batches, but the Grand Cru just hit my tastes perfectly. Beer Nerd Details: 11.5% ABV bottled (500 ml). Drank out of a snifter on 12/28/12. This is a sneaky one. I thought it was a 22 oz bottle, and it certainly looks at least bomber sized, but it's only 500 ml (16.9 oz). 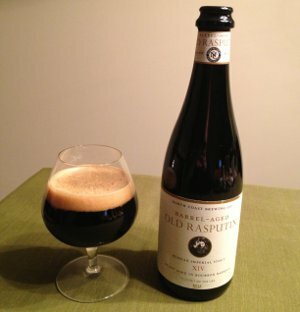 You can get a 4 pack of BCBS for a couple bucks more (and if some BA nerds are to be believed, some places jack up the price of BA Rasputin to well above that, on the order of $26-$30 which is a little ridiculous), and that stuff will kick your arse. Not that this is bad, the A- is nothing to whine about and I'm glad I tried it, but still. North Coast has not endeared themselves to me with these prices (Old Stock Cellar Reserve is no slouch in that department either, though at least that bottle looks like 500 ml). I'm sure they're all broken up about it. Do you brew? If so why? If not, why not? 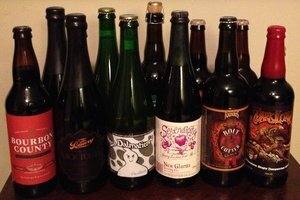 I have dabbled with homebrewing for a few reasons. First, I'm a huge nerd and actually did want to know more about beer and how all of its various characteristics were achieved, etc... But from my perspective, it was more about making something out here in the physical world. I recognized at some point that while I have participated in a lot of creative activities, both personally and professionally, most of what I've produced is virtual (i.e. most of my creative endeavors have primarily been done on a computer). There's nothing wrong with that, per say, but I wanted to make something out here in meatspace. So homebrewing has helped me scratch that itch, and I love beer, so it's been a really fun process. How does that affect your enjoyment of drinking beer? It's given me more perspective in what I like about beer, and I feel like my palate has become more attuned as a result. It also helps me understand what brewers are talking about, separating actual process from marketing fluff, and so on. In general, I think of all of this as a positive development, and I think I enjoy beer more now than I did a few years ago. I do think there's a danger in becoming too well versed in this, though I'm not really all that sure either (some of the other questions get into this, so see more below). Do you need to brew to appreciate beer? Of course not. In my mind, appreciation and enjoyment are easy. You don't need to know how something was made in order to appreciate or enjoy it. Indeed, I would say that most people don't know how the majority of things they use on a day to day basis are made, but that doesn't stop anyone from appreciating that stuff. Now, perhaps those that brew beer have a greater appreciation... or perhaps not. It's all very subjective. Do you enjoy beer more not knowing how it's made? The face of the water, in time, became a wonderful book--a book that was a dead language to the uneducated passenger, but which told its mind to me without reserve, delivering its most cherished secrets as clearly as if it uttered them with a voice. And it was not a book to be read once and thrown aside, for it had a new story to tell every day. Now when I had mastered the language of this water and had come to know every trifling feature that bordered the great river as familiarly as I knew the letters of the alphabet, I had made a valuable acquisition. But I had lost something, too. I had lost something which could never be restored to me while I lived. All the grace, the beauty, the poetry had gone out of the majestic river! I think this question of what was gained or lost because of learning a trade wasn't quite a simple as laid out in the quotes above. In terms of beer, I do think it's possible to get so wrapped up in the details of the brewing process that some of the majesty of drinking beer goes away, or is at least transmuted into something different than what most of us experience. Is that a good or bad thing? Again, I think it all depends on your perspective. If you're so inclined, you could feel the loss that Train felt. Or you could see the gain of something else entirely. Or maybe vacillate back and forth. Different strokes for different folks, I guess. If you brew, can you still drink a beer just for fun? Well, I certainly have no problem doing so. Would someone who has achieved a Twain level of mastery be able to? I would assume so. Can you brew without being an analytical drinker? This is a tough one, because I was an analytical drinker even before I brewed anything. I'd like to think that my analysis is better now that I brew, but I think we again come back to the subjective nature of the process. Are there brewers out there who can't help themselves but to analyze the beer they're drinking to death, even whilst in a social engagement? Probably. But I suspect most brewers would be able to turn off such analysis in at least some situations, alcohol being a social lubricant and all that. I certainly don't seem to have any problem doing so. Do brewers get to the point where they're more impressed by technical achievements than sensory delight? I think that's certainly possible, though I don't think it's an inevitable occurrence. In particular, I think a lot of brewers have become obsessed with strange and weird ingredients (I'm looking at you, Dogfish Head!) There's nothing inherently wrong with that, but my favorite beers tend to have a pretty straightforward set of ingredients. Oh, and they taste good. That's ultimately the bar that needs to be set for a question like this, and I think there are some breweries out there that take the whole experimental angle perhaps a bit too far, I think they're ultimately doing so in the hopes of opening up new avenues of sensory delight, which I can hardly fault them for. You never know until you try. Does more knowledge increase your awe in front of a truly excellent beer? I think it does, and actually, I think more knowledge has expanded the scope of what I'd consider truly excellent beer. 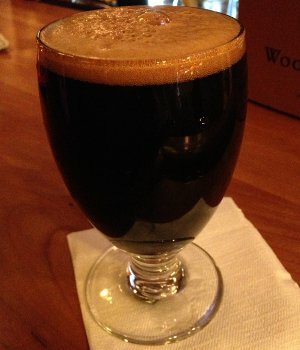 There are a number of beer styles or flavor profiles that I've found to be an acquired taste, and I think knowledge has helped unlock some of the secrets of such brews. Of course, knowledge comes in many different forms, one being knowledge of other beers, another being how a given beer was made. Ultimately, I beer is what we want it to be. It can be enjoyed with or without context, and while knowledge may change the ways in which one appreciates beer, it need not prevent enjoyment. Let's talk label artwork for a minute here. 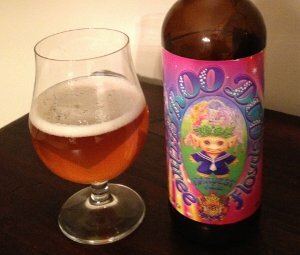 Three Floyds obviously employs talented artists for their labels and branding, but on the other hand, what the hell? Their main logo has a skull with batwings attached, kinda like an Ed Hardy dudebro logo. Then there's the label for Broo Doo, their fresh hop harvest ale. It features what appears to be a troll doll in a sailor's outfit, but instead of the typically furry hair, we've got a sorta hop/hair hybrid thing going on. Now, this is a little odd, but kinda par for the course in terms of beer labels. However, in the background, there's also a unicorn attempting to perform a Lucio Fulci-esque eye gouging maneuver on what appears to be a Disney princess (update: it may be Princess Peach, but the jury is still out on that one). And behind that, there's a fairy tale castle on fire with a rainbow flying over it. None of which mentions the outer portion of the label, which is all pastels, neon swishes, and stars, like something out of My Little Pony. In a bit of self-awareness, they have at least emblazoned the sides of the labels with the slogan: "It's not Normal" Well, they got that right. Beer Nerd Details: 7% ABV bottled (22 oz. bomber). Drank out of a tulip glass on 12/23/12. I've got a few more FFF beers left in the pipeline, but hoo, I'm going to want to get me some more of their stuff at some point. They are seriously pretty awesome at this whole beer thing. For the record, that's Bourbon County Brand Coffee Stout, The Bruery Black Tuesday, Fantôme La Dalmatienne, New Glarus Serendipity, Founders Bolt Cutter, and Three Floyds Dark Lord. And that doesn't include some other recent and exciting acquisitions. 2013 is shaping up to be a good one... at least, in terms of beer.